We serve breakfast, lunch and dinner seven days a week, excluding Thanksgiving and Christmas. Happy hour is from 3 p.m. to 6 p.m. Monday through Friday. Come to The Cliff Restaurant and enjoy cocktails and oceanfront dining. 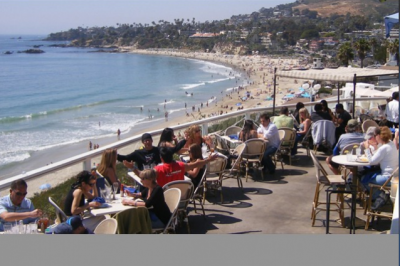 The Cliff Restaurant offers a world-class menu with an unsurpassed dining experience. Enjoy the 180-degree whitewater views from the multi-level patio while enjoying a relaxing breakfast or lunch, or catch a romantic sunset over dinner with a special friend. Our nightlife is jamming with live music at the bar and fire pits 6 nights a week! Check the calender page to see when your favorite band plays next! Whether you’re looking for a relaxing lunch, a fine dining experience or a venue for that special occasion, we have it all with a panoramic 180-degree view of the ocean. Oceanfront, open-air dining and cocktails are available daily at the spectacularly-situated Cliff Restaurant in the quaint Laguna Village artist community at 577 South Coast Highway in Laguna Beach. Tuesday: Taco Tuesday Taco Specials All Night Long with Live Music!